From left, Geoff Cameron, Kyle Beckerman and Michael Bradley of the United States work out during training Wednesday in Recife, Brazil. The World Cup has been a roller-coaster for the United States, which nearly drew with Ghana before beating it and nearly won against Portugal before drawing it. But overall, the Americans’ position is improved. It has about a 76 percent chance of advancing to the knockout stage — slightly more than double its odds before the tournament began. The U.S. will kick off against Germany at noon Eastern time in Recife, Brazil. By 2 p.m., its fate will be determined. If the Americans beat Germany, the math is simple: They’ll win Group G and will face the second-place team from Group H in the Round of 16. Their opponent would probably be either Algeria, whom the U.S. would be favored against — or Russia, against whom they would have about even odds. If the Americans lose, they’ll have to sweat the results of the other Group G match between Ghana and Portugal, which will take place simultaneously in Brasilia. They’ll get a reprieve if the Ghana-Portugal match is drawn, in which case the U.S. is guaranteed to advance in second. But a U.S. loss in Recife, coupled with a victor in Brasilia, could knock them out of the tournament. The table below describes what will happen if the U.S. loses its match, for all losing scores up to 4-0 Germany, and for all possible outcomes in Brasilia up to four goals scored by each team. For example, if the U.S. loses to Germany 2-0 and Portugal beats Ghana 3-1, the U.S. will advance over Portugal on the basis of FIFA’s goal-differential tiebreaker. Portugal, still disadvantaged from its 4-0 loss to Germany in its opening game, has to make up a net of five goals with the U.S. to make the knockout round. 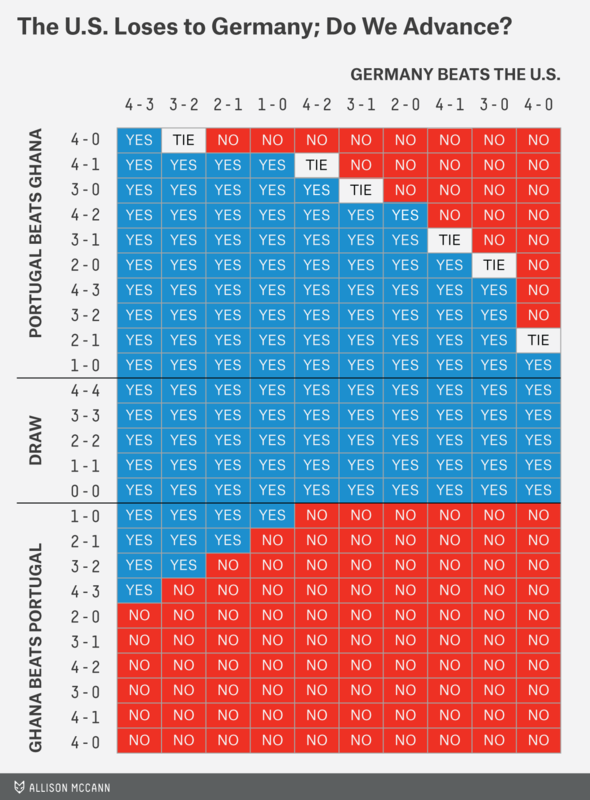 Although Cristiano Ronaldo might think otherwise, we can’t put it completely past Portugal to accomplish this: The Portuguese can score goals in bunches when in good form, and they have about a 5 percent chance of backing into the knockout stage. There’s even a remote chance that FIFA would have to draw lots to resolve a tie between the U.S. and Portugal: If Portugal beats Ghana 2-0 and the U.S. loses to Germany 3-0, both teams would be stuck on four goals scored and six allowed, and FIFA would resort to the luck of the draw. However, the bigger problem for the U.S. would be if it loses in Recife and Ghana wins in Brasilia. Then, any Ghana win by more than one goal, or any U.S. loss by more than one goal, would send Ghana forward. The U.S. does have the head-to-head tiebreaker against Ghana by virtue of having beaten it, but that will come into play only if the two matches finish with the same score line (there’s about a 2 percent chance of that happening). This could yield some interesting strategy and psychology at each venue. Say, for example, that about 75 minutes into Thursday’s matches, the U.S. trails Germany 2-1 while Ghana leads Portugal by the same margin. If those scores held, the U.S. would advance — so it might want to play quite defensively rather than seek an equalizer. But in Brasilia, the Portuguese would have almost nothing left to play for (merely drawing their match against Ghana or even winning it by one goal wouldn’t do them any good), and the Ghanaians would. If Ghana added a garbage-time goal against an indifferent Portuguese back line, the U.S. would be out. Incidentally, the Germans also have something to play for Thursday — at least in theory. They have not technically clinched advancement: They could be out of the tournament if they lose to the U.S. and there is a victor in Brasilia. However, the outcomes would need to be exceptionally lopsided given Germany’s +4 goal differential so far, which is why Germany has a 99.7 percent chance of going forward. Later Thursday, the final matches of Group H will take place. Belgium has clinched advancement but would do so as the second-place team if it loses to South Korea and Algeria beats Russia. Any other outcome advances the Belgians in first. Algeria clinches advancement by beating Russia, or if it draws Russia and Belgium beats or draws with South Korea. 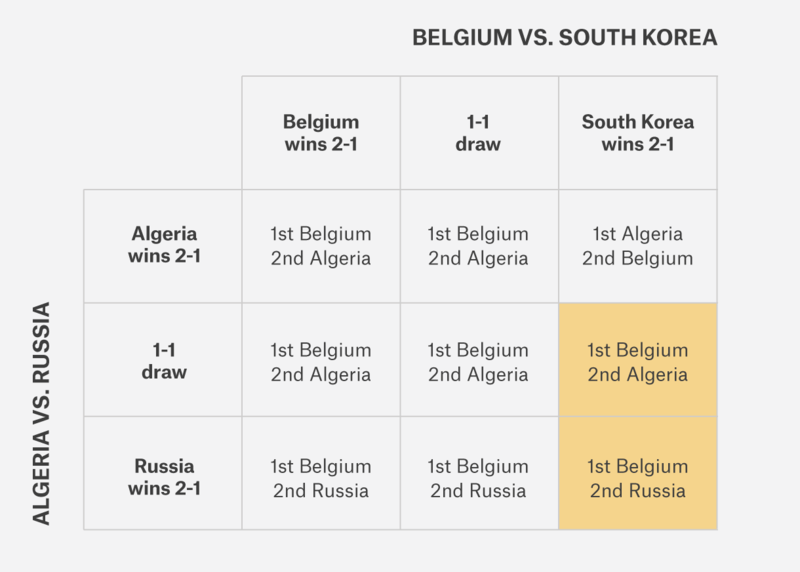 If Algeria draws Russia and South Korea beats Belgium, then Algeria and South Korea would be in a second-place tie — although Algeria would be strongly favored to advance on the basis of goal differential. If Algeria loses to Russia, Algeria is out of the tournament. Russia can advance only if it beats Algeria. In fact, it almost certainly will advance if it beats Algeria. The exception would require South Korea to beat Belgium by multiple goals. South Korea is not technically eliminated, but its chances of advancing are only about 1 percent. Its prospects require it, among other things, to beat Belgium by at least three goals in the event of an Algeria-Russia draw, or by at least two goals in the event of a Russian win. 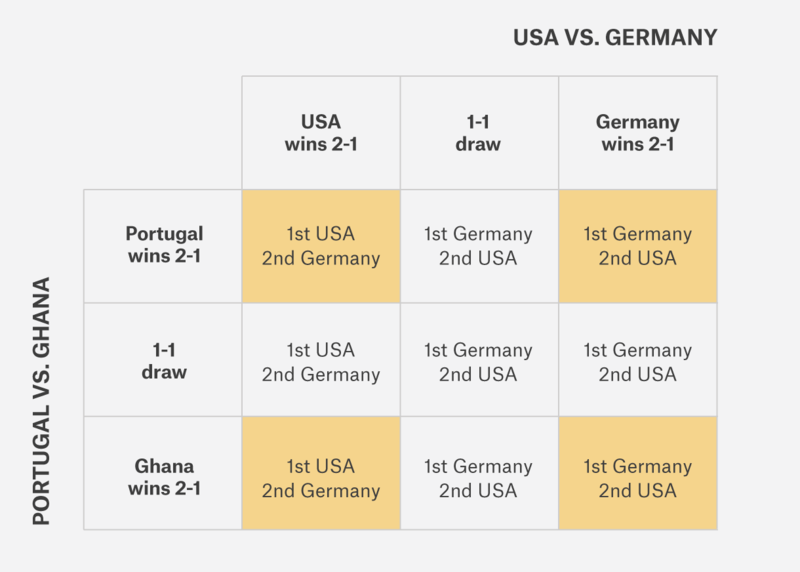 An interesting scenario might unfold in Group H if the U.S. beats Germany. Then Belgium might have an incentive to lose to South Korea and hope that Algeria overtakes it. That would set the Red Devils up with a Round of 16 match against the Americans instead of the Germans.